Right after I posted my journal entry last night, I decided to do some reading. What I didn’t seem to remember was that I never really enjoy reading in a tent. In fact, I don’t much care for reading at all when I’m on the trail. On almost every hike I’ve taken, I’ve brought along a book to read. And I am yet to read one. On one section hike on the AT I even carried a copy of The Adventures of Huckleberry Finn to read for about the tenth time. Alas, I never got past chapter one even though Huck Finn has always been one of my favorite novels. So what I learned from last night is that I will not be taking along a book, other than the AT Guide, when I begin my trek north next month. So what did I do in my tent in the middle of the woods without companionship last night? I debated whether to watch some you tube videos; however, since I also worried about my phone not maintaining its charge for two days, I determined that was not a good idea. Therefore, at a little before 9:00 PM I decided to call it a night and try to get a good night’s rest. As I remember, I quickly fell asleep and slept very well until I awoke some time later, or so I thought. When I checked my watch it was 9:20. In other words, I had gotten a very restful nap. Unfortunately it was the only sleep I was to get until I last checked my watch at 12:40 AM. I must have eventually fallen asleep because the next time I checked it was almost 5:00. As I lay awake wanting desperately for daylight to arrive so that I could again begin hiking, a light rain began to fall. This actually excited me since I had wanted to determine how well I had seam sealed my tent under true trail conditions. Even though it only drizzled for about an hour, all was well. Everything inside appeared to be dry as I packed up a little after 6:00. Knowing that there was an area about two miles into today’s hike with a picnic table under a pavilion, I decided to forgo cooking any breakfast until I arrived there. Breaking camp went well and I was on my way in just over an hour. 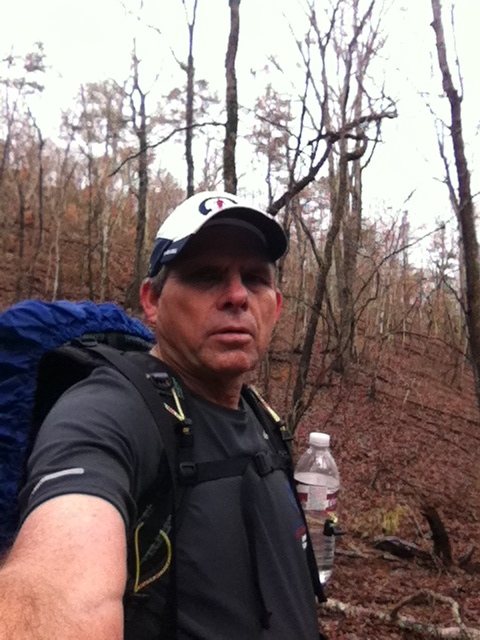 Despite a now wet tent, the ULA Circuit still felt comfortable as I traversed the .2 miles back to the main trail. When I arrived at the area with the pavilion, I set up my stove and made a cup of tea. I also considered cooking up some oatmeal but opted for an energy bar instead. Before leaving camp I had eaten three of the chocolate cookies I had baked. Due to a chilly sustained wind, lighting the super fly proved to be challenging. In fact, I don’t think the weak, tasteless tea was really worth the effort. It was also about this time that I remember, just like not liking to read while backpacking, that I really don’t like trying to cook either. 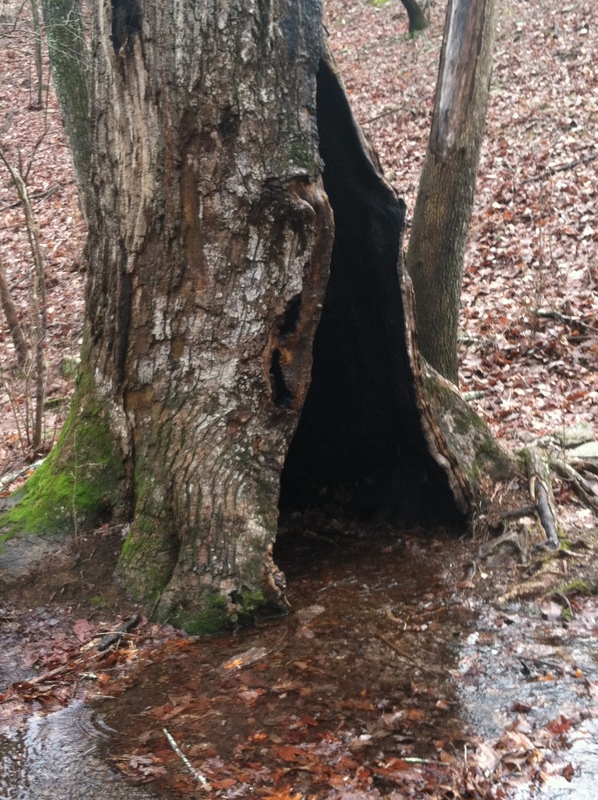 So at about 9:00 on Saturday, February 16, under cold windy conditions just off the Pine Mountain Trail in West Central Georgia, I made the decision to begin the Appalachian Trail thru hike stoveless. I know there are those who are already questioning this decision; however, if I change my mind I can buy one alone the way. After finishing my tea, I headed on up the trail. Although very cold and windy, the sun was out and I was dressed in just enough clothing to hike comfortably. Needing water, I also made a decision that I’ve often made when section hiking the AT. If there is a spigot nearby, there’s no need to retrieve water from a stream and have to treat it. Knowing that the Trading Post at a nearby campground was within a couple of miles, I sipped on the one bottle of water I had remaining until I arrived there. After filling the bottles from a sink behind the counter, I also chatted briefly with the proprietor, whose name I failed to get, before leaving. I rested for a few minutes at another picnic table in front of the store, ate some more cookies, and briefly entertained the idea of practicing yogi-ing some real breakfast from a couple grilling what smelled like sausage nearby. Needing to get on my way, I decided to wait until I arrive on the AT before I try my hand at that tradition. The hike today continued to go well. I met numerous day hikers as I strolled along. One couple walked with an unleashed, yet extremely well behaved, dog. A young female runner startled me as she passed, reporting back over her shoulder, “I didn’t think I was that quiet,” after I gasped a “you scared me,” when she went by. For a few seconds I kind of wished I had had on running clothes and could have joined her. Her effortless movements briefly increased the weight of my pack. There would be other days to run. Today I was hiking. A little later I stopped for another break, again where I found a bench on the trail. It came complete with a medal plate noting the Eagle Scout project for which it had been completed. As I rested and ate a peanut butter and jelly sandwich on a tortilla, a young military gentleman stopped to ask directions. Proclaiming that his map was not substantial enough, I shared mine with him and offered help. He thanked me as he strode into the distance with camo daypack on his back. As I approached the end of today’s hike I saw in the distance three young men sitting atop a rock outcrop. Getting closer I recognized one as the son of one of my good running buddies. Bailey, at only 15, has become quite the runner and outdoorsman over the past few years. He even joined a group of my buddies on a 6 mile run to celebrate my 60th birthday in 2011. Out for an overnight camping trip with his younger brother, Bennett, and a friend, Bailey exhibited that youthful zest for adventure as he told me where they would be camping tonight. Before hiking on—in my best fatherly voice—I reminded them to stay warm since the temperature was going down to the 20’s tonight. The last day hiker I encountered, before arriving back at my vehicle, was another young man that I’m pretty sure was in the service. He wore an orange University of Tennessee T-shirt and shorts even though it was still cold on this sunny early afternoon. Stepping aside for me to pass, he called me sir three times in about fifteen seconds when I told him he didn’t have to do that. He reminded me of just how fortunate we are to have such polite, thoughtful young folks in our midst today. I thanked him in turn. When I totaled up today’s miles, it only came to 11.6. I had originally planned to walk farther, but still it had all in all been a good overnight shakedown hike. Other than deciding to leave the stove behind, I also make a couple of other significant decisions regarding gear that I think will go a long way to making my attempt at a thru hike become a reality. There will be many nights on the AT when I will hike to a shelter and set up camp for the night. There will also be days when I will hike to a town where there is a shower and a hot meal awaiting. Today was one of those. It had been a good two days on the Pine Mountain Trail, just as I’m sure there will be many beginning next month as I make my way northward on the Appalachian Trail. Ok, it’s only 7:30 and I’m in a tent in the middle of the woods, miles from nowhere, as Cat Stevens used to say. There’s no one else around, but I’m comfortable, that is as comfortable as one can be in a tent in the middle of the woods. Unlike on The Appalachian Trail, there’s no one else around. I did see a group about a couple of miles back at a campsite. They had very nice tents. They looked heavy, however. The tents, I mean. Kind of luxury camping it seemed. So as I compose this piece from my tent in the dark I’m realizing just how journaling will be on the trail. Hold on just a minute while I try to get comfortable. I’m leaning on my right elbow for the moment. That seems to be the best position. Did I mention that it’s really dark outside. Oh well, it’s only about 12 hours until sunrise. So this is my shakedown overnight hike to check out my gear for my upcoming attempt at a thru hike of the Appalachian Trail. The day began well. I checked in at the FDR State Park Headquarters to secure my overnight camping permit a little before 1:00. After filling out the registration and.briefly chatting with the very helpful female ranger, I headed down the rock steps behind the building to begin walking east on the Pine Mountain Trail. For today’s hike I decided to hike up the trail to where the PMT connects to the Sawtooth Trail, which is part of the Big Poplar Loop Trail. I hiked for 8.4 miles to this campsite which is really quite nice. There’s a fire ring and some good blow downs to sit on. After setting up my tent I cooked a Knorr side but must admit that I also had an Arby’s French dip sandwich which I brought with me. Hey, they were two for $5, so I ate one at the restaurant and saved the other for supper. I also brought along some chocolate cookies that I baked last night. After eating I made a couple of phone calls, and that’s about it. I did stop at Jenkins Creek to get some water just before camp and used my Aqua iMira for the first time. Well, I think I’m going to read for a while and then turn in. Tomorrow I’m going to hike another 13.5 before heading home. I think I hear something walking around, but it’s probably just my imagination. At least I know it’s not a bear. A dog (I guess it’s a dog) is barking in the distance and I can vaguely hear traffic far away at times. Think I’ll read now and then call it a night. Looking forward to many nights like this when I get to the Appalachian Trail. As my day of departure gets closer, I find it increasingly difficult not to think about the trail with some degree of obsession. Between continuing to read gear reviews (despite having secured all that I plan to begin with), reading journals of past hikers, and training by hiking or running almost every day, I find little time for anything else. I feel as if I could begin tomorrow even though I realize that waiting until my scheduled departure date is still more practical. So that is what I continue to do…..wait. But then is there really anything wrong with waiting? Aren’t we somewhat conditioned by society to expect to wait on a regular basis? At 61 years of age I shouldn’t be wishing away my days to reach the day I plan to begin my northward walk. After all, it will arrive eventually. Then within a matter of less than six months, hopefully, the adventure will culminate with a final day of exhilaration. So in the meantime I hope I’ll continue to appreciate the opportunity to prepare. 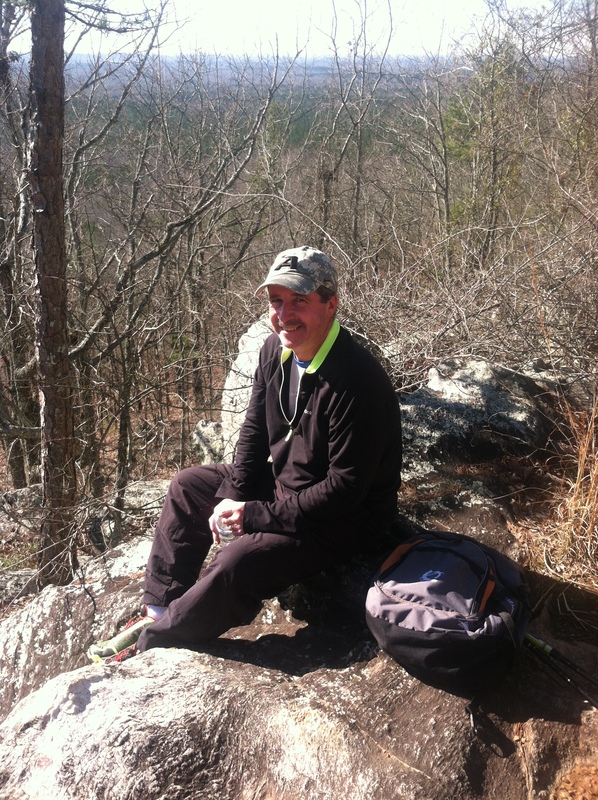 This past Saturday I hiked the Long Leaf Trail on Pine Mountain with my good running buddy, Kevin.. Taking a few breaks to rest and talk with friends and other hikers, we covered the 6.9 miles in about three and one-half hours. On Saturday mornings of the past I would run long, beginning downtown, with a group of buddies. More recently the Saturday runs have gradually shortened. But now as I continue to transition from the runner to the hiker, I’m finding myself more often in the woods than in the park. As Kevin and I neared the end of the hike, we encountered three of those running buddies who were out for a trail run as they prepared for the upcoming Pinhoti 50K. It was good to pause and chat a few minutes with Troy, John C., and Torrey. These were three of our teammates when we participated in the Run for the Heroes Run Across Georgia a couple of years ago. I especially appreciated John’s mantra as he navigated the trails, “Stay vertical.” That’s something I hope to do as I hike the AT. We also saw Alton Hogan, the hiker from Florida, who has been training on the PMT in preparation for his thru hike. Alton said he is going to leave whenever he foresees “three consecutive days of good weather.” I like his approach. It would be nice to see him again on the AT; however, with his start date being over a month before mine, that doesn’t seem very likely. Still Alton assured me that he would be checking my journal for updates. We again wished each other well as he headed up the rock steps toward the FDR park office to secure his camping spot for the night. 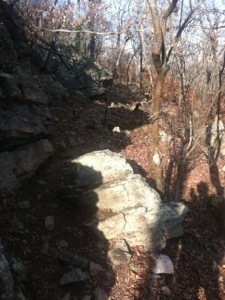 As always it was good to see and visit with others as I hiked today. Being able to meet new people and share our experiences is something that I look forward to with enthusiasm as I continue to await the day I sign in as a thru hiker and begin my journey on the Appalachian Trail. I read somewhere that many of those who have good intentions of updating a hiking journal daily eventually stop doing so. The reason…fatigue at the end of a long hiking day. So as I sit here in the comfort of my home, after a rather hard day of training, I’m wondering how I’ll feel after a similar day on the AT. Sure, I’m tired, but I’ve also had a hot shower and a nutritional meal, not to mention time to relax. After a day of hiking, most likely I’ll often be in a tent or shelter, will not have had a shower, and will have consumed my usual dinner of a Knorr side with meat from a pouch added. I’ll probably add a few other items; however, I’ll most asuredly always be tired when I begin to write. Today was another day that I did two workouts. Shortly after a light breakfast with coffee, I left my home for a jaunt over to the neighborhood park, Cooper Creek. My run today totalled 8 miles, two more than I had originally intended. The two extra were at an easier pace with a friend I hadn’t seen in a while. After returning home, I got the hiking gear ready, loaded up the Explorer, and headed up to the Pine Mountain Trail at Roosevelt State Park. Before leaving town I again detoured by a nearby McDonald’s for lunch. I decided to purchase three burgers, one to eat as I drove, another to eat when I arrived at the east end of the trail near Warm Springs, GA, and a third to eat at some time during the hike. I also carried with me today a couple of energy bars and several mini snickers. Not wanting to stop and treat water, I took two 20 ounce bottles as well as a 32 ounce Gatorade. For today’s hike I selected the 6.7 mile Wolfden Loop, starting at the eastern terminus of the trail. I opted to travel on the PMT at the beginning of the hike and finish the white blazed part of the loop last. The second mile of this loop challenges at times with several water crossings. Since it had rained substantially yesterday, there was more water to negotiate than there had been the last time I hiked this section of trail. When I arrived at Cascade Falls, just before the two mile mark, I stopped to drop my pack and take a few pictures. 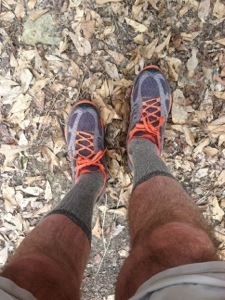 Having received a couple of emails while hiking, I decided to respond to both before resuming the walk. I also sent a pic to Alton, my good buddy who always emails me, “I hate you,” when he knows I’m hiking. I’m genuinely sorry that he’s still teaching rather than hiking with me, so I recently responded to said comment with, “Dont hate me; Join me.” He will on a weekend hike some time real soon. Despite having tired legs, the hike went well today. I took one more break just before five miles and finished that last burger. Even though I snacked and drank almost continuously, I still felt hungry and thirsty after the hike’s completion. There is no way to over-emphasize the importance of caloric intake and water consumption when hiking the AT. I’ll have to use extreme caution to ensure that I don’t allow dehydration to become an issue. As I neared the end of today’s walk, I spotted a solitary hiker with a dog approaching in the distance. I paused to chat for a several minutes with Kevin, a day hiker who said he had logged over 11,000 miles of hiking. 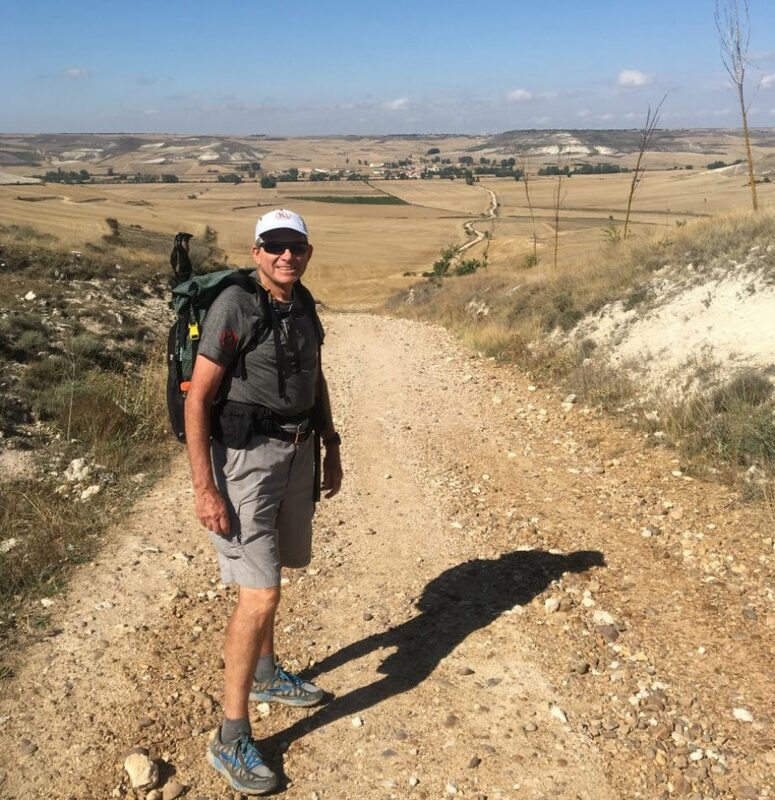 He hikes daily on the PMT and stated that he had covered every square foot of trail numerous times. A former runner before knee issues, he too stated that he had at times had aspirations to attempt a thru hike of the Appalachian Trail. Kevin said he hoped to maybe give it a try after his retirement. We wished each other well as I turned to head toward the parking lot at the TV tower and my SUV. All in all, it was a good training day. Yes, I’m tired, but fatigue is a state that I’ll have to learn to embrace as I make my way north on the Appalachian Trail. Today was a good training day. After a light breakfast and the morning newspaper, I decided to go for a run. As the run progressed I felt stronger with each mile covered, finishing a 6 mile run with a 7:53 final mile. That’s the fastest mile I’ve run in a while. For these almost 62 year old legs, I was extremely satisfied. After cooling down a bit I felt like some sort of celebration was in order, so I loaded up the pack with all my gear inside, except the tent, and headed up to the Pine Mountain Trail. Before leaving town, however, I decided to stop at a nearby Subway to take advantage of their February footlong special. I ate half of the sub there and took the other with me for a second lunch on the trail. Since I have been known to carry a coke at times when hiking, I thought today was also the perfect day to take along a 20 oz soda which somewhat made up for the weight of the tent. For today’s hike I selected the easy to moderate 7.8 Big Poplar Loop. I began the trail south from the nearby Mollyhugger parking lot. A slightly overcast cool early afternoon afforded a perfect day for a walk through the Georgia woods. I averaged right at 20 minutes a mile early with short breaks for snacks and water. I wanted to work on drinking more water to ensure that my hydration levels were good. The afternoon progressed quickly as I ambled along the winding path. With a little less than two miles to go, I determined that it was time for a longer break to finish that other half of the sub. So when I came to the last campsite on the loop, Beech Bottom, I meandered down the side trail to an open area with a fire ring. Just as I was putting back on my pack, I spotted another hiker coming into view on the trail. As I approached the solitary sojourner, we both remarked that we did not expect to see anyone else on the trail today. A. H. explained after a few minutes of casual hiker talk that he was getting ready for a thru hike of the AT. When I told him that I was as well, the talk turned to the trail, gear, and a few other topics. He had already spent one night in the woods on this prep hike and planned to camp for two more on this trip. From Jacksonville. 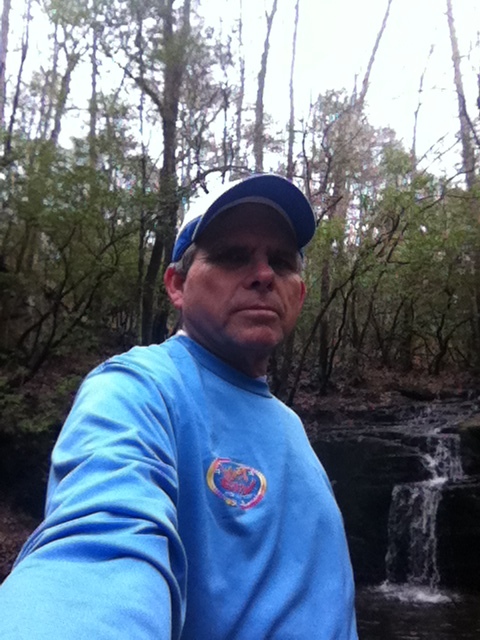 Florida, A. H. had been making occasional visits up to the Pine Mountain Trail to get in some practice hikes. I hope that the little information I shared with him about the AT will prove helpful as he begins his thru later this month. After wishing him well, I quickly negotiated the final 1.8 miles, arriving at my SUV a few minutes after four. Even though I felt somewhat tired, overall I had run and hiked well. The drive home enabled me to access just where my fitness level is right now. So far all is going well. It had been a good day for training indeed! Only a little over 6 weeks until I begin my trek on the Appalachian Trail.